This month I've been very motivated. I've been working hard at dance, and also cross training with weight resistance and cardio on the elliptical machine. I've been trying really hard to eat whole wheat and lots of great veggies and fruits. I've been enjoying it--more than I thought I would. I want to take care of my body. 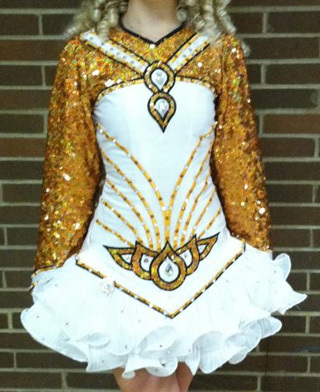 I want to Irish dance until I am old. Do you see the connection? If my body isn't in great shape, I won't be able to continue my love of Irish dance as long as if I take control of my lifestyles. What do you like for a reward? It probably shouldn't be food-related if you are trying to lose weight. If you continue to strive for your goal, reward yourself with a new book, a night out at the movies, or even simply a bubble bath. Write up what you want to accomplish, or create a collage of photos that remind you of your goal. Then put it somewhere where you will see it every day. I am going to post a photo of a solo dress on my bathroom mirror. A friend of mine suggested that I put a note in my pantry that reads, "Your solo dress is not in here." Every time that you are tempted to slip, consciously think of the motivator. We all have down times and that is when it is most important to push through and keep going. Note: Any Irish Dance teachers (TCRGs/TCRGs-in-training) looking for a change of scenery? Shane McAvinchey is looking for some help with teaching for a few months starting January in Munich. Please email shanemcavinchey@gmail.com for more details if you or anyone you know may be interested!